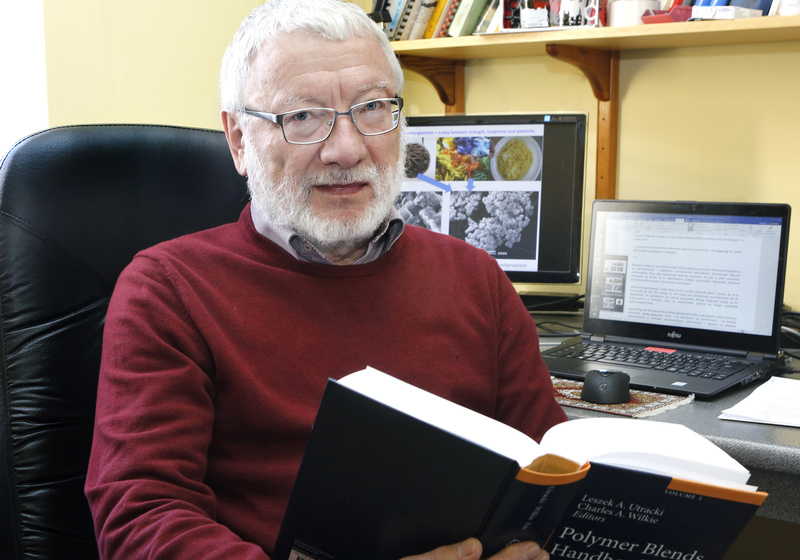 Prof. Andrzej Gałęski from the Centre of Molecular and Macromolecular Studies of the Polish Academy of Sciences in Łódź has won the 2018 Foundation for Polish Science Prize in the field of chemical and material sciences for developing a new mechanism for plastic deformation of polymers. The 2018 Foundation for Polish Science Prize is awarded to Prof. Andrzej Gałęski for identifying and explaining the mechanisms for plastic deformation of polymers. Synthetic polymers are now a huge class of materials used across all fields of the economy and for everyday purposes. We most often encounter them in the form of packaging, but most of these materials are used in construction, electrical installations, water and sewer systems, agriculture, vehicles, and so on. In Poland over 3 million tonnes of synthetic polymers are used every year, and in volume terms they long ago exceeded the consumption of metals. Given this scale of production and use, even tiny innovations become extremely valuable. Although synthetic polymers are popularly referred to as “plastics,” for years their plasticity was not fully understood. It seemed that permanent reshaping was due to melting and re-crystallization of polymer crystals. Prof. Andrzej Gałęski analyzed processes of plastic deformation and found that it was due to crystallographic slips. This entirely changed the scientific perception of procedures for obtaining new materials. Gałęski’s works have led to the development of plastics long-awaited by the aviation and automotive industries. In his research, the FNP Prize laureate took on two major scientific challenges. First, he discovered, described and named the important phenomenon known as “cavitation.” Cavitation is responsible for the whitening of polymer plastics visible to the naked eye during excessive bending, stretching or striking. Gałęski thoroughly studied this phenomenon and learned to control it. By controlling cavitation, he obtained rods and tapes stronger than steel. Second, Gałęski overcame the complicated phenomenon of entangling of macromolecules. He found a method for ensuring that very long molecules in polymers did not become entangled. He obtained a material so plastic that it could be reshaped to the level of nanofibres, which could then be used to reinforce other polymers. This gave rise to promising super-strong nanocomposites. They are used in the form of nanocomposite foams as parts for race cars, airplanes, motor yachts, and wind turbine propellers. The laureate’s research also involved environment-friendly nanomaterials. The material he obtained in the form of a polylactide tape is biodegradable in compost, yet strong and durable under normal conditions. Such a plastic could replace traditional materials in a range of applications, from light and durable travel cases to packaging and automotive parts. The works by Prof. Gałęski and his research team in Łódź have inspired researchers in labs all over the world. Thanks to the efforts of the FNP Prize laureate, Poles have begun to lead the world in polymers research. Prof. Andrzej Gałęski (born 1945) is a graduate of the Faculty of Mathematics, Physics and Chemistry at the University of Łódź. He earned his doctorate in technical sciences and his postdoctoral degree at the Faculty of Chemistry at the Łódź University of Technology. He held a postdoctoral fellowship at Case Western Reserve in Cleveland, Ohio. He obtained the title of professor of chemical sciences in 1993. He worked for two and a half years at the Massachusetts Institute of Technology. He was a visiting professor at the prestigious École Nationale Supérieure d’Arts et Métiers in Paris and at the CNR Institute of Technology and Rheology of Polymers in Naples and Pisa. Currently he heads a research group at the Centre of Molecular and Macromolecular Studies of the Polish Academy of Sciences in Łódź, where he was previously director of the Department of Polymer Physics. Prof. Gałęski has earned many distinctions and awards. In 2010 the received a medal and the prestigious Paul J. Flory Polymer Research Prize from the Scientific Committee of the World Forum on Advanced Materials for his original and universal contribution to the science of polymers. He has published some 200 scientific articles in prestigious journals such as Nature, Science, Macromolecules, Progress in Polymer Science, and Polymer. His articles have been cited about 6,000 times.